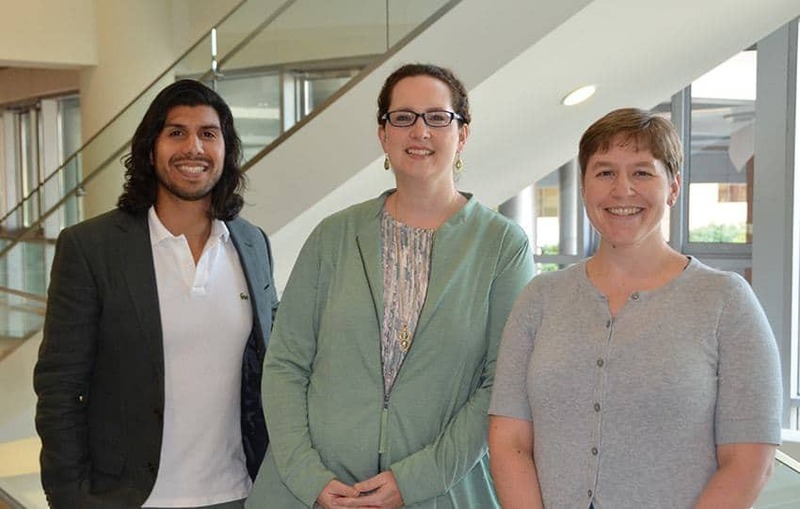 The team working to implement UAMS' cancer genetics telehealth program includes (from left) Joshua Acuna, research associate; Kristin Zorn, M.D., director of the Division of Gynecologic Oncology; and Mindy Simonson, genetics counselor. Sept. 20, 2017 | Sept. 20, 2017 – A grant of more than $55,000 to the University of Arkansas for Medical Sciences (UAMS) will assist health care providers across the state to identify and treat families with an inherited risk for cancer. The one-year grant totaling $55,554 was presented to Kristin Zorn, M.D., director of the Division of Gynecologic Oncology in the UAMS College of Medicine, by the Arkansas Cancer Coalition (ACC) at its quarterly meeting Sept. 12. “This funding will allow cancer genetics specialists at UAMS to use our state’s extensive telehealth network to train local health care providers about inherited cancer syndromes and their impact on cancer risk. These providers will then be better equipped to help their patients take steps to manage or reduce their risk of developing cancer,” said Zorn, who also leads the Hereditary Gynecologic Cancer Clinic at UAMS. Telehealth is the use of high-speed, interactive video that connects doctors and patients from distant locations. The program’s initial goal is to educate local health care providers, via telehealth, about Lynch Syndrome, an inherited disorder that increases the risk of colon, endometrial and several other types of cancer. The program also will implement guidelines that local providers can use to evaluate colon and endometrial cancer patients for the syndrome. UAMS genetics specialists will guide the providers through the screening process and help identify and counsel patients with Lynch syndrome about strategies for managing their cancer risk. “By identifying families who have Lynch syndrome, we can help them make informed decisions about options to prevent or detect early-stage cancer. These include screening efforts such as colonoscopy or cancer prevention through risk-reduction surgery, such as hysterectomy,” said Zorn.